“It must be emphasized that this new movement will not be “disengaged” from the wider society, only “differently engaged.” We are, quite simply, replacing political activism with cultural activism as the center of our focus. And while the visibility of the new movement will be less pronounced than the existing (political) conservative movement in the short term, the seeds that we now sow will have dramatic repercussions over the long term. We have the capacity to fundamentally transform the face of American culture in the 21st century by following a different path, one built on the aggressive dissemination of our cultural values, rather than the idle hope that enough of our cultural values still remain in the body of the American people to carry us on to a few more isolated electoral victories. “Our movement will be entirely destructive, and entirely constructive. We will not try to reform the existing institutions. We only intend to weaken them, and eventually destroy them. We will endeavor to knock our opponents off-balance and unsettle them at every opportunity. All of our constructive energies will be dedicated to the creation of our own institutions. 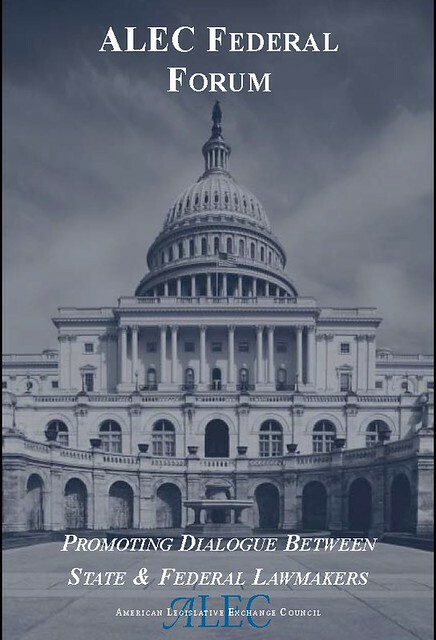 For those who probably missed the published research report on ALEC’s Federal Government and Corrupt Practices VLTP released last November, you should take the time to download and read this comprehensive report. 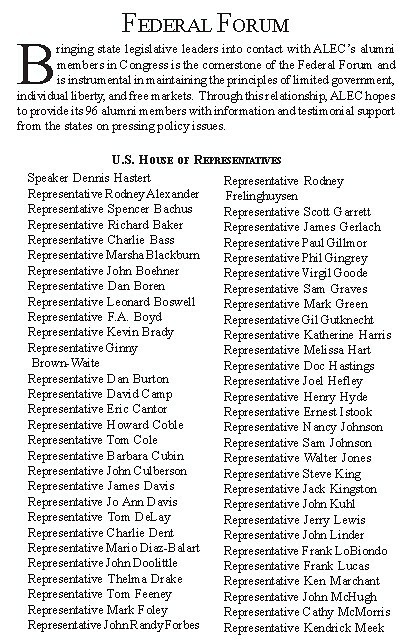 The full report ties President Bush, VP Cheney, Don Rumsfeld and others directly to ALEC. 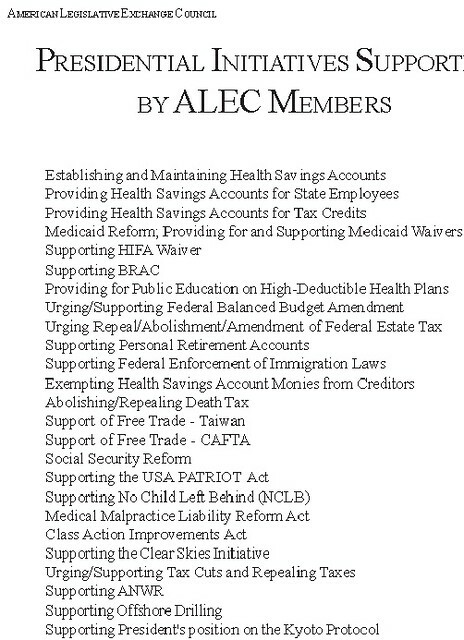 You will want to have this report on hand if you have any intention or desire to inform others about ALEC or pursue them as I have.The following is based upon that research which consumed 24 months of effort. ALEC’s Federal Forum TF is one of the key tools being used to accomplish a primary goal provided in the above treatise – “Weaken and eventually destroy” American institutions and replace them with “their own” institutions. To accomplish this they have to work from within. The security mechanisms put in place generations ago to protect the integrity of our many “institutions” (agencies, departments, schools, state and federal legislatures) are all designed to deflect attacks from the outside. Those on the inside are required to guard against attempted subversion’s or changes to our agencies and departments coming from the outside. Unfortunately when those charged with such internal security are infiltrated by elected, appointed or hired individuals that have a desire to destroy democracy from within, those security measures fail. 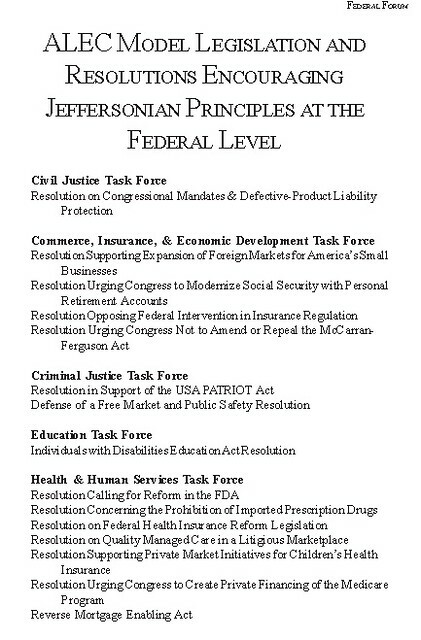 Looking back to 2005 we can clearly see from this policy document what the objectives were for this federal forum. What continues to hide beyond our research is who has served as co-chairs from 2006 through 2012? The initiatives they pursued within Congress, the success or failure of those models and policies. A full reading of the entire Fed Forum document is beyond enlightening and frightening to those of us who have a desire to maintain our democracy and democratic processes in place and functioning as they have for more than 200 years. It also answers our questions about how ALEC and the Koch cabal have been able to quickly advance particularly favorable state legislation into the federal arena. Of particular interest – and as a way of demonstrating the linkage between ALEC and the other cabal organizations and members, pages 19 and 20 have to be read. 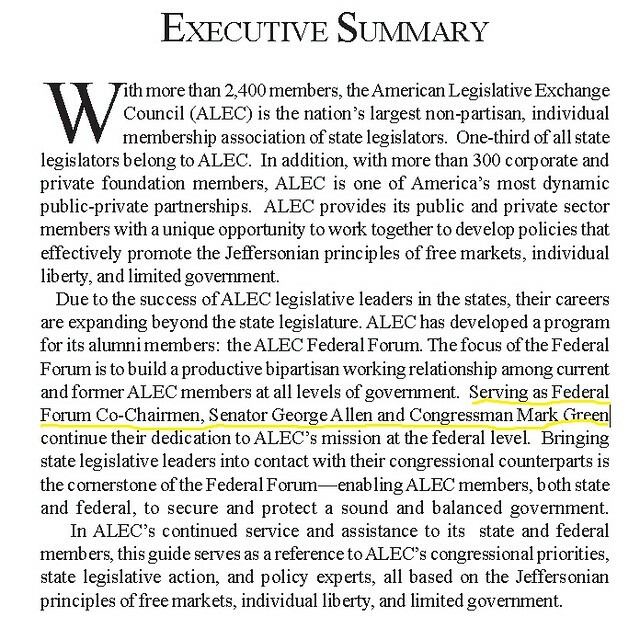 On those pages ALEC lists their “State Policy Experts” to be contacted by members with questions on the policies being pursued at the federal level. These experts are from all the usual suspect stink tanks; Evergreen, Reason, Shook, Hardy and Bacon, the Friedman Foundation, Alliance for School Choice, Competitive Enterprise Institute, American Enterprise Institute, Progress & Freedom Foundation, Tax Foundation, Institute for Health Freedom and the Heritage Foundation. 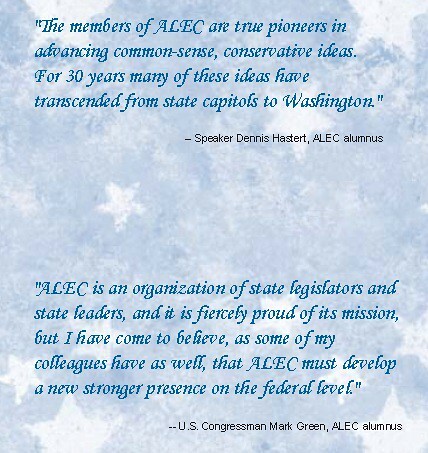 With nearly 100 members now serving in our House and Senate, the ALEC “Alumnus” represents a large caucus that can be used to push an agenda – or to block the agenda of Democrats and others. When combined with the Koch bought members who prevailed and were elected in 2010, Koch and their cabal now have over 200 representatives representing their interests in our Congress…out of 535 total members. We should all be getting extremely worried about the future of our democracy – really worried. 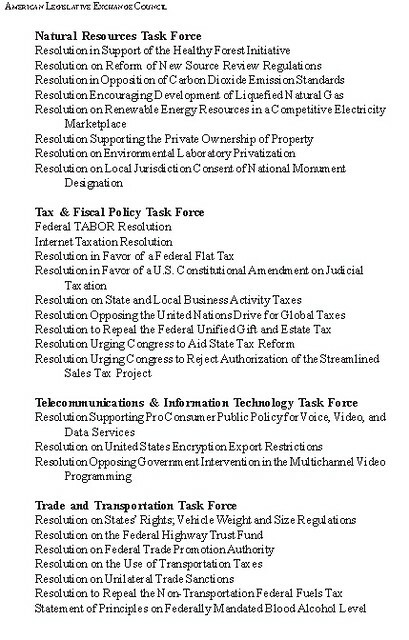 As most of you will now understand, the initiatives of 2005 shown above are still being pursued and argued vigorously in Congress and at the state level; tenth amendment, balanced budget pursuits, patriot act, reverse mortgage act, social security and Medicaid “reforms”, eliminating the federal estate tax, immigration enforcement, healthcare and repeal or support of lower taxes (corporate)…its all there in this document…and in Congress being debated in every session. Fresh in everyone’s mind is the battle over increasing the debt ceiling, and the Republicans pushing for a balanced budget amendment in 2011. Also on our minds is the pursuit of offshore drilling initiatives – and the impact of that due to the Event Horizon oil spill incident in the Gulf of Mexico two years ago. Now, through the lens of the ALEC Federal Forum task force we can see the influence(s) that enabled and continue to pursue these key conservative initiatives from within Congress. Of interesting note to the creation and development of this task force, is the creator himself and who he is. A former aide to Congressman John Ashcroft brought along with Ashcroft as he assumed the duties of Attorney General in 2001, was a man named Andrew Schauder. As more and more of our research reveals, Schauder is in the growing number of the cabal individuals, organizations, foundations and corporations operating out of Wisconsin. Schauder is listed as a native of Green Bay. Andrew Schauder has 10 years of experience developing and maintaining strategic relationships at the federal, state and local levels to meet the goals of senior government officials as well as private sector companies. Previously, Andrew served as Acting Chief of Staff and Deputy Chief of Staff at the U.S. Department of Labor under Secretary Elaine L. Chao. His job included managing and directing policies and programs at the $11 billion cabinet agency that achieved record results in protecting the health, safety, wages, and retirement security of the nation’s workforce. Andrew was a member of the Management Review Board and chaired the grants review team.Prior to joining the Office of the Secretary, Andrew managed strategic relationships with Department of Labor stakeholders including state and local legislators, governors, mayors and membership organizations as the Senior Intergovernmental Officer. Before his tenure at DOL, Andrew was the Director of Federal Affairs for the American Legislative Exchange Council (ALEC), the nation’s largest non-partisan, individual membership organization of state legislators. He created and managed a federal outreach program that increased the visibility and effectiveness of the organization and its members. Andrew built unprecedented levels of participation and engagement between ALEC’s public and private sector members and Congress. From 2001 to 2005 Andrew served at the U.S. Justice Department as Special Assistant to the Attorney General in various capacities including in the Office of Legal Policy, the Office of Legislative Affairs, and the Office of Intergovernmental and Public Liaison. Andrew served on the Ashcroft 2000 Senate campaign focusing on policy and research. From 1999 to 2000 he worked in the Office of U.S. Senator John Ashcroft as a Research Assistant. Andrew joined The Ashcroft Group to be with a familiar team of known, talented professionals whose unique background and experience provides a mission-driven culture that delivers results to its clients. The positions held, influence wielded helped Schauder develop the Federal Forum so that it was the best venue possible to enable the cabal to quickly and efficiently incorporate their initiatives and agenda directly into our Congress. Additionally, we now know for certain that the cabal think tanks and organization are the “go-to” experts who provide the ALEC lawmakers with faux scientific reports, talking points, discussion topics, etc. Reason, Heritage and the other’s agenda are brought into both houses and disseminated to other members of Congress through the bought and paid for lawmakers who serve ALEC and Koch…and are proudly listed by ALEC as noted above. Obviously Schauder was a wise choice and his work is still benefiting ALEC long after he moved on. Through his travels and work we are able to see how the revolving door works for ALEC and the cabal; they simply move key individuals (in reality lobbyists) in and out of government service where and when it serves their agenda. With each transition favors are earned, traded and acquired that can be used in the next transition to the benefit of the lobbyists, corporatists and of course, ALEC. When combined with the membership Exposé referenced and linked to above, there is much cause for concern. As the wording at ALEC’s Federal Relations link provides above, the agenda remains the same – only hidden behind a thick and nearly impenetrable curtain. 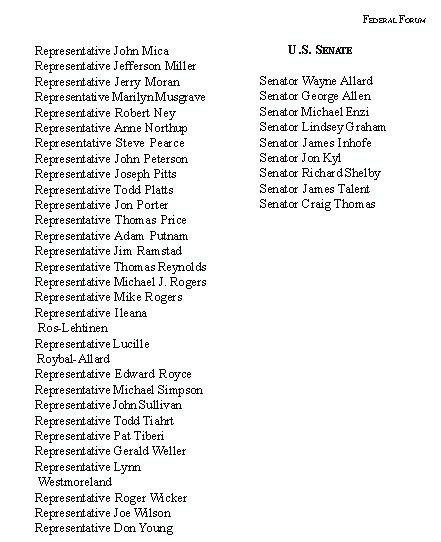 We have no idea who the Congressional “Co-Chairs” of the FF Task force is today…the initiatives pursued (though the ongoing battles in Congress provide some insight)…and unfortunately we have less knowledge about which foreign officials may be “helping” push the conservative ALEC/Cabal agenda. What we do have is a nearly complete listing of the corporations funding this crap. Nearly thirty corporations, several foundations and dozens of lawmakers have abandoned ALEC but hundreds of each still remain loyal to the cabal. As we pursue abolishing ALEC we have to pressure those enabling lawmakers, companies and “charities” remaining ALEC members to leave them as well. Without funding ALEC and the Koch led cabal cannot function. Without lawmakers to advance the legislation, businesses donating to the lawmakers and a way for lobbyists to meet secretly with lawmakers, ALEC cannot continue to exist.